Audio Loudness and True Peak Metering VST, AU and AAX plugin is based on the latest broadcast standards: BS1770 (rev.3), EBU R128, ATSC A/85 and ARIB TR-B32. 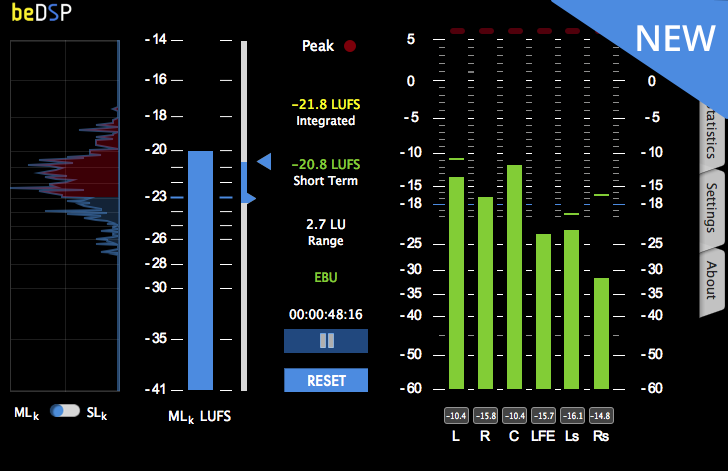 ALM 5.1 works with the usual formats, Mono, Stereo and 5.1, displaying the main loudness descriptors at all times, including Momentary, Short Term and Integrated Loudness, with Loudness Range and Max True Peak Level.New features include histogram and statistics report. 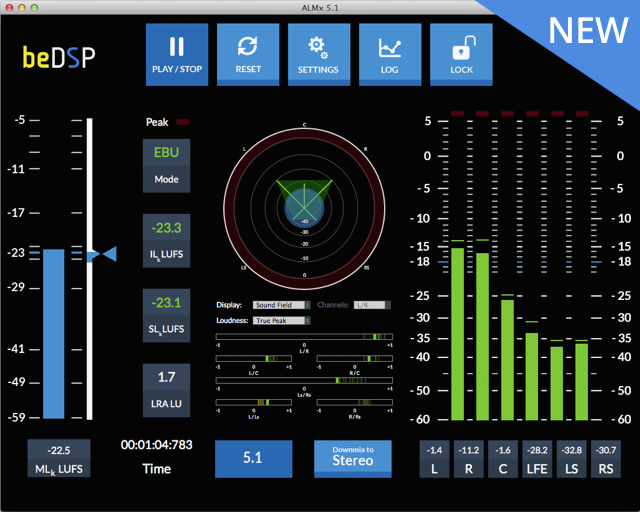 Audio Loudness Metering Light Edition VST, AU and AAX plugin is based on the latest broadcast standards: BS1770 (rev.3), EBU R128, ATSC A/85 and ARIB TR-B32. ALM 5.1 LE is more compact than ALM 5.1, you can view the main descriptors in statistics and choose the limit for the True Peak. ALMx 5.1 was designed as a key component for complex broadcast systems. Based on the ALM 5.1 plugin, ALMx 5.1 features a series of enhancements, making it a perfect fit for live broadcast situations. The application is ITU, EBU, ATSC and ARIB compliant, oferring advanced logging and comprehensive audio I/O settings. New features include vectorscope, sound field display, correlation meters and downmixing. This particular standalone application can be very useful and helpful for audio engineers working in post production and broadcasting enviroments. The major two steps of the workflow consists in analyzing the audio material and rendering an improved one. You can pick between program loudness or short term loudness, used for materials that are shorter than 3 minutes. A True Peak Limiter is available with variable knee width, release time and true peak. This plugin offers Loudness and True Peak normalization for Harmonic’s Rhozet® Carbon Coder according to BS-1770 (rev. 3) and EBU R128. Based on the ALM 5.1 loudness detection and our own normalization algorithm, this nifty plugin helps you get your material according to your desired values.